Located in the Southwest Residential Area, this award-winning dining commons features many display cooking area with freshness in mind. The dining area is divided into 10 distinct food stations, each with its own theme and menu selection, ranging from vegetation to Pan Asian to rotating restaurant-style cuisine. Open until midnight 7 days a week, featuring Late Owl Cafe on Fridays and Saturdays. Berkshire Dining Commons is handicapped accessible. 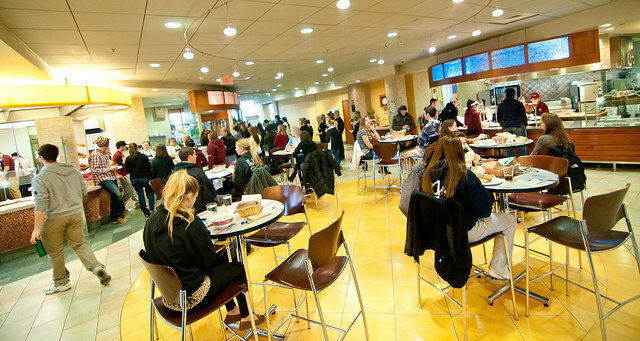 Late Night Dining offers students one last chance to meet friends and have a snack (or an entire meal) before the day ends. Berkshire Dining Commons is open until Midnight so there is plenty of time to sit, relax and reflect on the day.